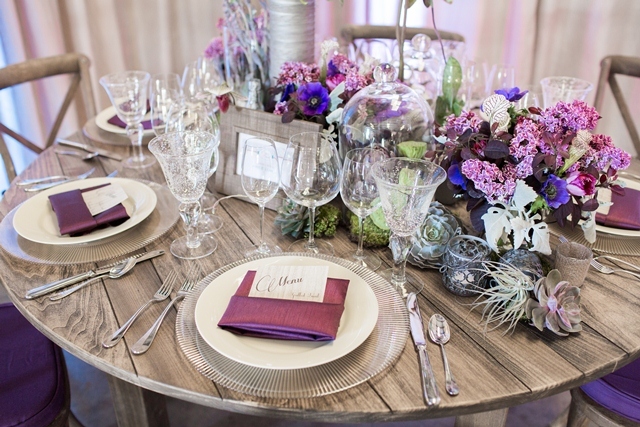 Working together with Aimee Lomelli Floral Design on this whimsical table design was so much fun. As soon as we saw some of the work she had created in the past for her events, we knew we would be a perfect pairing! The look required a natural canvas, so we went with our new round farm table and our bistro chairs. 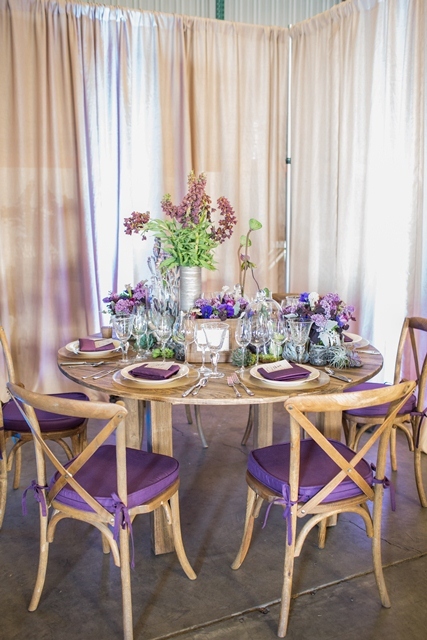 To create a great vignette, we used our natural beige fabric pipe and drape with purple uplights to represent the theme’s color. The florals were the statement of the table, so with that in mind we went with amber luster chargers, ivory china, and renzo flatware. For the water goblets we used our clear bubble glass and for the drinks, we used our crystal wine and champagne glasses. The menu design was created by Ashley Printables. She went with a faux-wood design that was perfect for the whimsical style. 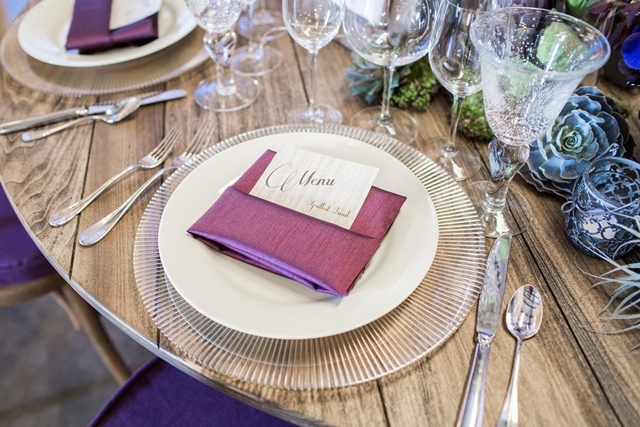 We used eggplant colored chair pads and napkins. And finally the floral touch from Aimee. Take a close look at the florals. 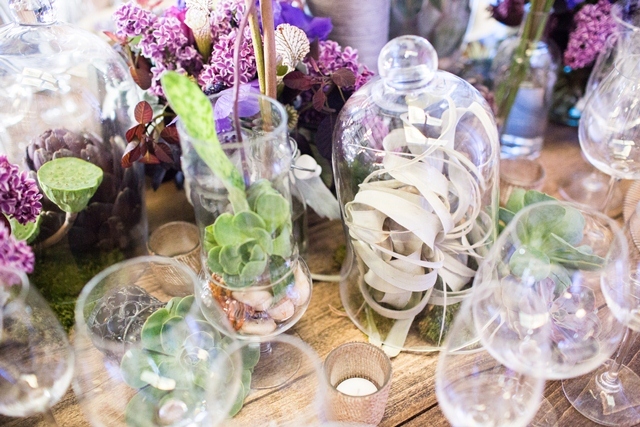 She combined small terrarium succulents with purple and green florals. Simply gorgeous! 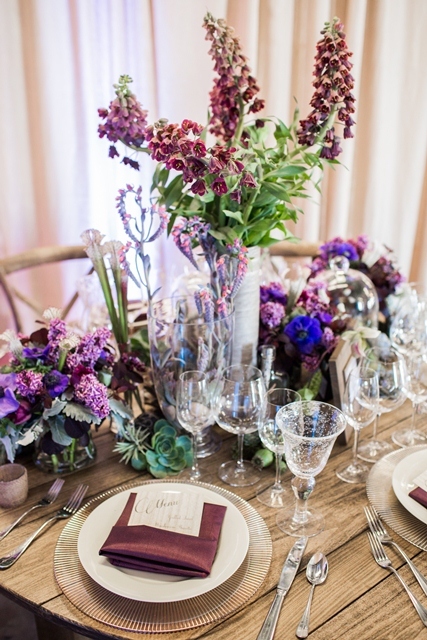 This whimsical table design was a huge hit and everyone immediately feel in love.